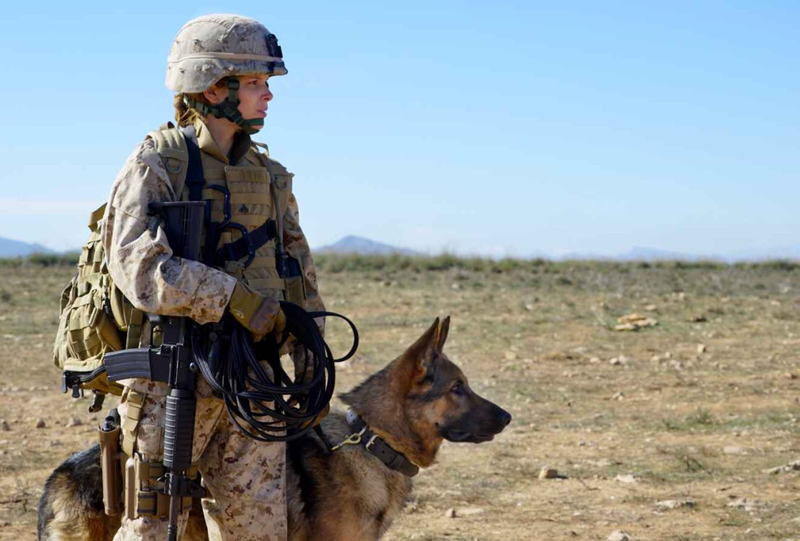 “Megan Leavey” is an entertaining war drama about a young woman named Megan Leavey, who joins the Marines in order to escape her miserable life, and ends up befriending Rex, the dog in combat. They both end up injured from an explosion in Ramadi, and after rehabilitation, Megan decides not to re-enlist, and adopt Rex for saving her life. Of course, it becomes complicated, since these dogs are no longer rendered as pets, but as soldiers. Kate Mara, fresh from “Fantastic Four” and “Morgan,” gives her best performance to date as Megan. Her mother (Edie Falco) has left her husband (Bradley Whitford) for his bum friend Jim (Will Patton), and her best friend has passed away; so there’s nothing left for her in New York. That’s why she joined the army. Although she starts out as a mess from drinking, she manages to redeem herself, when she is assigned to work with Rex, the most aggressive dog in the corp, on missions, up until their attack. Mara and the dog both have chemistry as they both have issues, and manage to overcome them. You also get a nice cast with Ramon Rodriguez as a Mets fan and Corporal, who becomes her lover; Common as the Gunnery Sergeant; and Whitford even adds a nice touch as her father. So, we have a nice cast here. I only have one issue, and this is a personal issue. The movie didn’t do anything wrong; it’s just me. I wasn’t too thrilled with how Sergeants yelled as Megan in the beginning. I know this is how the army is, but I sort of have a thing about that. Asside from that, “Megan Leavey” is a fresh movie with a star-changing game for Mara.